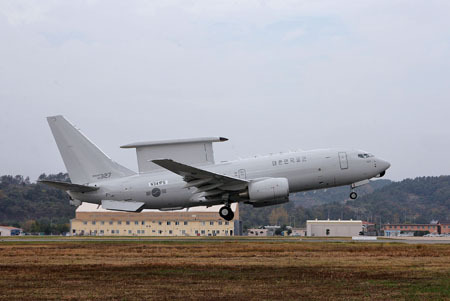 ROKAF BASE GIMHAE, South Korea, Dec. 13, 2011 -- The Boeing Company [NYSE: BA] today delivered the second Peace Eye 737 Airborne Early Warning and Control (AEW&C) aircraft to the Republic of Korea Air Force (ROKAF). The aircraft was delivered ahead of schedule to ROKAF Base Gimhae, the main operating base for the Peace Eye fleet. Peace Eye No. 2 is the first aircraft in the fleet to be modified into an AEW&C configuration by Korea Aerospace Industries (KAI) at its facility in Sacheon. "The quality of KAI's work has been outstanding. Their commitment to excellence, their focus and their technical expertise were critical to the achievement of this major milestone," said Randy Price, Peace Eye program manager for Boeing. Two additional Peace Eye aircraft are being modified by KAI in Sacheon and will be delivered to the ROKAF in 2012. The Peace Eye program includes four 737 AEW&C aircraft plus ground support segments for mission crew training, mission support and system maintenance. 737-based AEW&C aircraft also are in production for the governments of Australia and Turkey. Based on the Boeing Next-Generation 737-700 commercial airplane, the 737 AEW&C aircraft is designed to provide airborne-battle-management capability with an advanced multirole electronically scanned radar and 10 state-of-the-art mission crew consoles that are able to track airborne and maritime targets simultaneously. The mission crew can direct offensive and defensive forces while maintaining continuous surveillance of the operational area. A unit of The Boeing Company, Boeing Defense, Space & Security is one of the world's largest defense, space and security businesses specializing in innovative and capabilities-driven customer solutions, and the world's largest and most versatile manufacturer of military aircraft. Headquartered in St. Louis, Boeing Defense, Space & Security is a $32 billion business with 63,000 employees worldwide. Follow us on Twitter: @BoeingDefense.